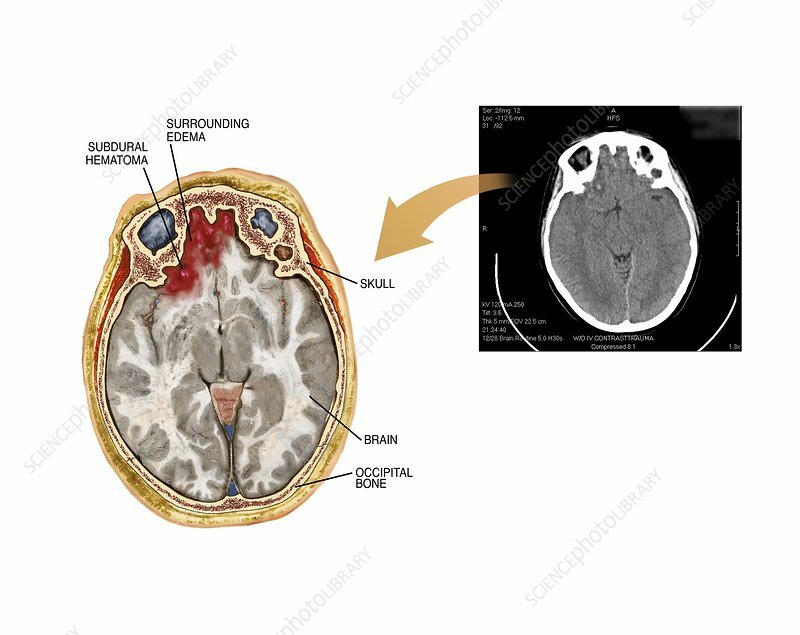 Subdural haematoma. Labelled artwork and corresponding computed tomography (CT) scan (right) of an interhemispheric (in both brain hemispheres) subdural haematoma (red, upper left) and a non-displaced left occipital skull fracture (occipital bone labelled). At left is an axial view of the skull and brain, with the front of the brain at top. A haematoma is an accumulation of blood from internal bleeding, in this case into the space between the dura mater (outer brain membrane) and the brain. Oedema (fluid accumulation) is also present. Typically caused by blunt force trauma to the skull, surgery may be required to relieve pressure caused by the internal bleeding.